Looking to fill up your iPhone or iPad with free apps? Great deals are constantly popping up in the App Store, and here are 43 apps that are now free. 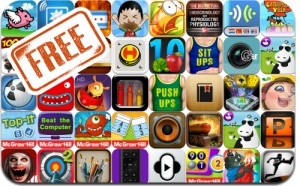 This apps gone free alert includes Gosar Episode One, Saving Yello, Martians, ArcherWorldCup2, Old MacDonald, Jailbreaker 2, MusicTandem, The Mouth: Talking Doodles, Cool Retina Wallpapers, Remote for Roku, and many others. Caterpillar Yellie, where could summer be?